Green Pier to Home Plate of the Chattanooga Lookouts: A continuous movement from river level to field level. At the beginning of the Fall 2018 semester, my partner, Evan Scaria, and I decided to challenge a large, simple surface parking lot as our stake of territory that embodies a great amount of potential for continuing the growth and development of Chattanooga’s waterfront considering the site is directly adjacent to the Tennessee River, AT&T Field, the Tennessee Aquariums, and the existing riverfront amenities. The major goals of our vision include: connectivity, river engagement, accessibility, wellness, and recreation. The context of Chattanooga, Tennessee: the chosen territory rests on the last western piece that offers an abundant amount of possibilities for continuation of the Chattanoogs’s Ramble. The Ramble is an urban master planning project that sought out to build on the momentum of the progress made in Chattanooga over the past three decades. This new ‘promenade’ which starts at the Hunter Museum of American Art and ends at the Chattanooga Pier created a new pedestrian path that meanders through many public amenities of downtown. The Ramble was built on several principles including Access & Connection, Destination, Diversity, Water, and Comfort. Our proposed project seeks to build on the qualities that The Ramble embraces. 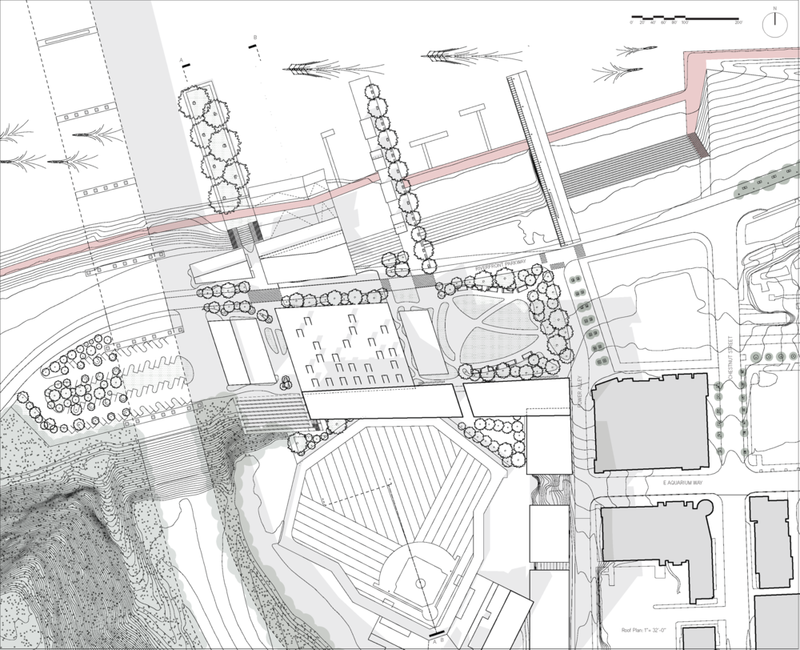 The thesis of this project was to extend the limits of The Ramble while simultaneously intertwining the major qualities of downtown Chattanooga: the green, the urban, and the water. The territory that we have chosen, 201 Riverfront Parkway, is an existing large surface lot and its surrounding adjacencies is the last major site in the core of downtown Chattanooga that has the opportunity to continue The Ramble’s promenade through our proposed additional civic programs. Our site is the final piece of urban fabric that exists downtown that can embrace civic continuation. The development of Chattanooga’s riverfront has been on going for about 30 years; a 13 mile Riverwalk trail (from Chickamauga Dam to St. Elmo) boat launches, parks, docks, urban plazas, and riverfront housing all now inhabit The Tennessee River. Our project thrives off the momentum that the riverfront development has created. The newly proposed kayak rental and outdoor equipment retail building directly engages with the Riverwalk with a launch apron that bisects the Riverwalk. Intertwining the Green, the Urban, and the Water: enhancing Chattanooga’s waterfront with two piers, a watercraft launch bisecting the existing Riverwalk, and extending the lower level of existing green to meet the launch apron. Our Vision: The major elements that our project weaves together throughout the site are The Green, The Urban, and The Water. 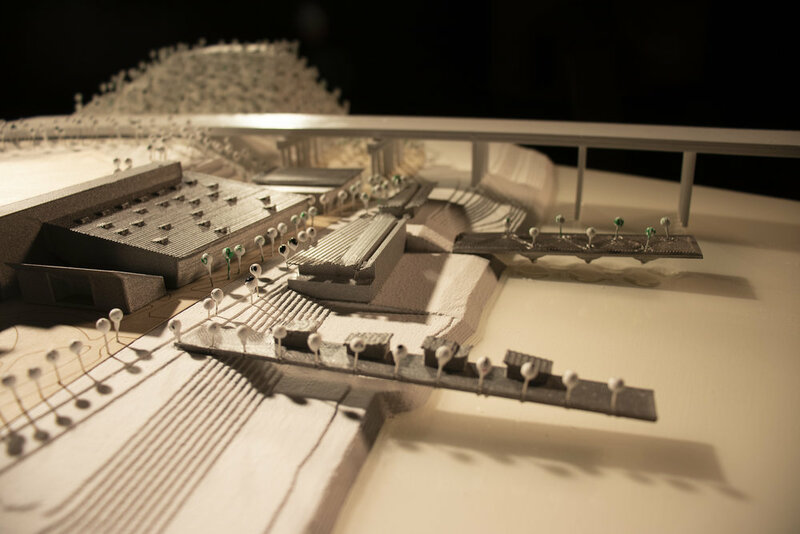 By intertwining these three threads, a village of exciting and interstitial spaces emerged. While weaving these threads together, an urban tapestry now engages the once, industrial Tennessee River, amplifies the already beautiful riverfront and Aquarium Way area, and constitutes a legitimate, modern environment for AT&T Field.